- from Jim P, CDx3 Notification Service subscriber. See more preferred stock investor reviews here. The highest quality preferred stocks that are selling for a sub-$25 market price are offering income investors an average 5.4 percent Yield-To-Call in today's preferred stock marketplace and there are now 13 of these gems to pick from. 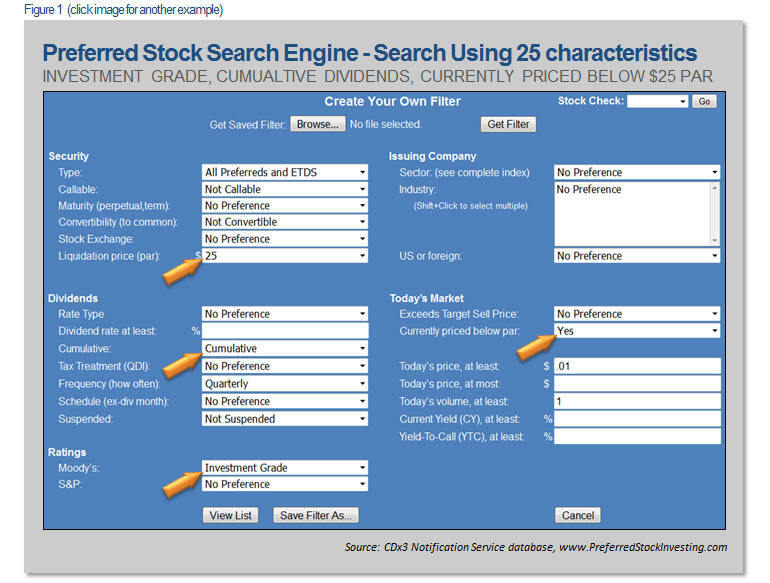 Figure 1 shows the complete filter used to find the highest quality preferred stocks available for less than $25. Of the twenty-five parameters that can be set, the four arrows highlight the keys for this search. Setting the "Currently priced below par" parameter to "Yes" does the magic here. There were a total of 944 preferred stocks and ETDs trading on U.S. stock exchanges as the month came to a close (including convertible preferred stocks). Of these 944, these are the top ten highest quality issues that are trading below their $25 par value. This list is sorted by dividend rate (coupon) with the highest payers listed first. 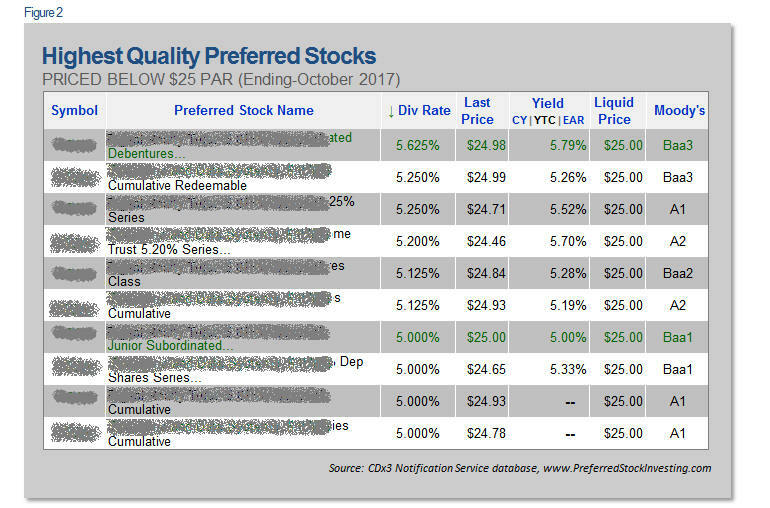 All of these high quality securities have a current market price (seen in the Last Price column) that is below their $25 par value (as shown in the Liquid Price column) and enjoy an investment grade rating from Moody's. Note that the YTC for two of these securities cannot be calculated since they are now callable. 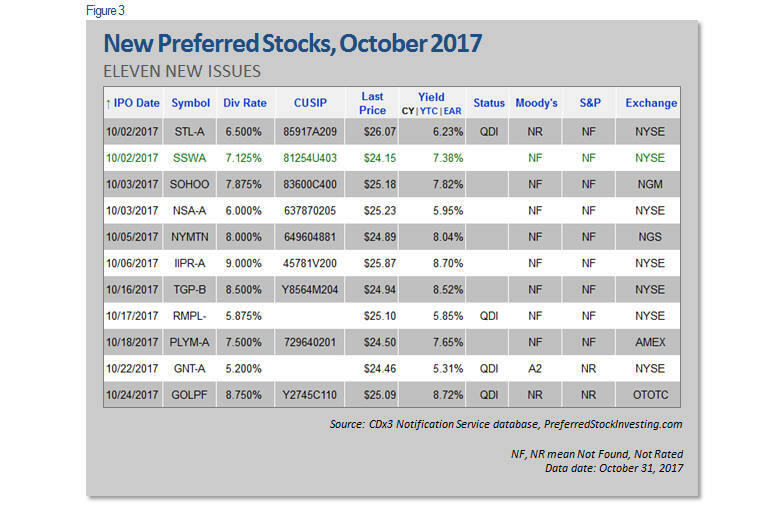 The robust number of new preferred stock offerings continued throughout October with eleven new issues being introduced during the month. October’s eleven new preferred stocks are offering an average dividend (coupon) of 7.3 percent. Here are the eleven new issues introduced during October for the consideration of preferred stock investors. 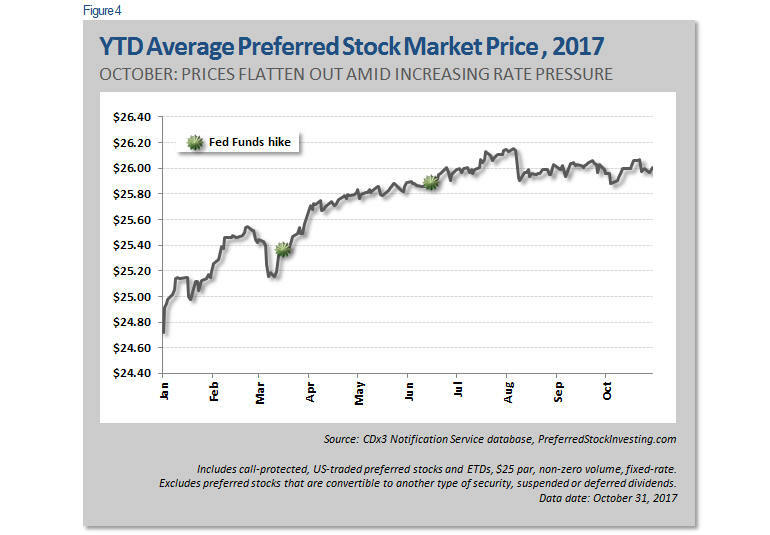 There are currently 95 high quality preferred stocks selling for an average price of $25.81 (October 31), offering an average coupon of 5.54 percent and a current yield of 5.36 percent. And thirteen of these high quality issues are selling below their $25 par value, providing an average yield-to-call of 5.35 percent. By high quality I mean preferreds offering the characteristics that most risk-averse preferred stock investors favor such as investment grade ratings, cumulative dividends and call-protection. There are now a total of 944 of these securities trading on U.S. stock exchanges (including convertible preferred stocks). Note that the newest issue – GOLPF from Golar LNG Partners LP (GMLP) – is still trading on the wholesale Over-The-Counter exchange (as of October 31). This is a temporary OTC trading symbol until this security moves to the NGM exchange, at which time it will receive its permanent symbol. But there is no need to wait; during a period of relatively high prices, individual investors, armed with a web browser and an online trading account, can often purchase newly introduced preferred stock shares at wholesale prices just like the big guys (see "Preferred Stock Buyers Change Tactics For Double-Digit Returns" for an explanation of how the OTC can be used to purchase shares for discounted prices during a period of high preferred stock prices). Those who have been following this strategy of using the wholesale OTC exchange to buy newly introduced shares for less than $25 are more able to avoid a capital loss as prices start to drop (if they choose to sell). Your broker will automatically update the trading symbols of any shares you purchase on the OTC. GOLPF will become GMLPP (probably by the time you read this). The diversity of the eleven new October issues is striking. Securities from four property REITs, one mortgage REIT, four companies tied to natural resources and shipping, one bank and one investment management company were all introduced during the month. REITs come in two flavors – property REITs and mortgage REITs. While property REITs make money by owning physical property and leasing it out, mortgage REITs make money by investing in residential and/or commercial mortgages (the idea being to borrow cash at a low rate and use that cash to buy mortgages that pay a higher rate). SOHOO from Sotherly Hotels (SOHO), NSA-A from National Storage Affiliates (NSA), IIPR-A from Innovative Industrial Properties (IIPR) and PLYM-A from Plymouth Industrial REIT (PLYM) are all cumulative, perpetual preferred stocks offered by property REITs. “Cumulative” means that if the issuer misses a dividend payment to you, they still owe you the money (short of a bankruptcy); their obligation to you accumulates. 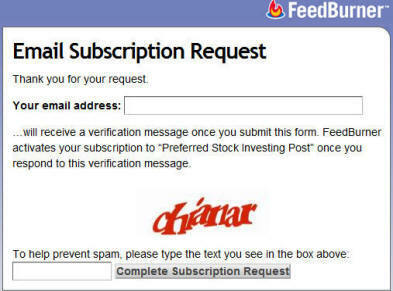 “Perpetual” means that the issuer is not required to ever redeem your shares (i.e. the shares have no maturity date). Diversity can also be found within this group – Sotherly Hotels, hotels; National Storage Affiliates, self-storage; Innovative Industrial Properties, and Plymouth Industrial REIT, industrial facilities. In an unusual move, Sotherly’s SOHOO preferred stock was issued at 7.875 percent with the proceeds being used to redeem all outstanding shares of the company’s older SOHOM Exchange-Traded Debt Security which paid a lower 7.0 percent. While this maneuver increases the company’s annual dividend expense by about $100,000, the transaction converts debt (the old ETDS) into equity (the new preferred), improving the company’s all-important debt-to-equity ratio. All of these property REIT issues are traditional preferred stocks offering fixed-rate dividends. New York Mortgage Trust (NYMT) is a mortgage REIT, investing in residential mortgages. NYMTN pays a fixed 8.0 percent dividend until its October 15, 2027 call date. At that time, the dividend rate of this security becomes variable based on the three-month LIBOR rate (currently at 1.37 percent) plus 5.695 percent. These four October issues surround the activities of those who extract natural resources and move them around. All four securities offer cumulative dividends. SSWA is an Exchange-Traded Debt Security from Hong Kong-based shipper Seaspan Corporation (SSW). ETDS’ are bonds recorded on the company’s books as debt (rather than as equity, as in the case of preferred stock). As debt, the obligation to pay the interest on these bonds is cumulative. As bonds, ETDS’ are often seen as having lower risk than the same company’s preferred stock shares. ETDS are very similar to preferred stocks and are often listed on brokerage statements as such. Seaspan now has four preferred stocks and two ETDS’ trading on U.S. stock exchanges. TGP-B is from Bermuda-based Liquefied Natural Gas shipper TeeKay LNG Partners, LP (TGP), a master limited partnership. Like NYMTN, TGP-B offers a fixed-to-floating dividend rate, paying 8.5 percent until its October 15, 2027 call date. At that time, the coupon of this security will be calculated by the three-month LIBOR rate plus 6.241 percent. The new series B preferred stock is the company’s second offering within the last thirteen months. GNT-A is from GAMCO Natural Resources (GNT), a closed-end fund. According to the fund’s prospectus, the fund “…will attempt to achieve its objectives by investing at least 80% of its assets in securities of companies principally engaged in the natural resources and gold industries.” This security is the only rated October offering, with an A2 rating from Moody’s. GOLPF/GMLPP is issued by Golar LNG Partners, LP (GMLP), another Bermuda-based shipper of LNG products. While very similar to TeeKay’s TGP-B, GOLPF/GMLPP offers a fixed 8.75 percent coupon that does not float. Further, the dividends paid by GOLPF/GMLPP are a distribution of the company’s after-tax profits and therefore qualify for the special 15 percent tax treatment (more on this below). Dividends paid by TGP-B, on the other hand, are made from pre-tax cash and are therefore taxed as regular income. STL-A is offered by Sterling Bancorp (STL), a financial services firm offering retail banking services to businesses and individuals in or near New York City. While the prospectus of this security does not specifically say so, it is likely that the proceeds from this offering have gone toward Sterling’s acquisition of Astoria Financial Corporation on October 2, 2017. STL-A is a non-cumulative, traditional preferred stock. RMPL- from RiverNorth Markplace Lending Corporation (RMPLX) is the only “term” preferred stock among October’s offerings. This traditional, cumulative preferred stock matures on October 31, 2024. If it is still trading at the time (i.e. if is has not been called on or after its October 31, 2020 call date), shareholders will receive the security’s $25 par value in cash in exchange for their shares. 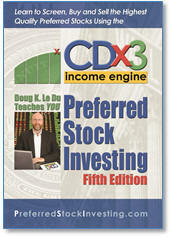 Source: Preferred stock data - CDx3 Notification Service database, PreferredStockInvesting.com. Prospectuses: STL-A, SSWA, SOHOO, NSA-A, NYMTN, IIPR-A, TGP-B, RMPL-, PLYM-A, GNT-A, GOLPF/GMLPP. The tax treatment of the income you receive from income securities can be a bit confusing, but it really boils down to one question – Has the company already paid tax on the cash that is being used to pay you or not? If not, the IRS is going to collect the full tax from you; if so, you still have to pay tax, but at the special 15 percent rate. With that rule in mind, here is how the tax treatment of October’s eleven new issues plays out. Companies incorporated as REITs, be they property REITS (Sotherly Hotels, National Storage Affiliates, Innovative Industrial Properties, Plymouth Industrial REIT) or mortgage REITS (New York Mortgage Trust), are required to distribute at least 90 percent of their pre-tax profits to shareholders. Doing so in the form of non-voting preferred stock dividends is the most common method of complying and because these dividend payments are made from pre-tax dollars, dividends received from REITs are taxed as regular income (i.e. they do not qualify for the special 15 percent dividend tax rate). Interest that a company pays to those loaning the company money is a business expense to the company (tax deductible), so the company does not pay tax on the interest payments it makes to its lenders (i.e. interest payments made to lenders are paid with pre-tax dollars). Since Exchange-Traded Debt Securities are debt (Seaspan), ETDS shareholders are on the hook for the taxes. Income received from ETDS’ is taxed as regular income. Lastly, if a company pays your preferred stock dividends out of its after-tax profits, the dividend income you receive is taxed at the special 15 percent tax rate. Such dividends are referred to as “Qualified Dividend Income” or QDI. QDI preferred stocks are often seen as favorable for holding in a non-retirement account due to the favorable 15 percent tax treatment. Looking at the Status column in the above table, dividends received from Sterling Bancorp’s STL-A, RiverNorth’s RMPL-, GAMCO Natural Resource’s GNT-A and Golar LNG’s GOLPF/GMLPP, are a distribution of the company’s after-tax earnings and are therefore designated as being Qualified Dividend Income (see prospectus for exceptions and conditions). So how do the new October issues stack up within the context of today’s preferred stock marketplace? For many months now, two of the most significant contributors to upward price pressure have been (1) continued zero-to-negative rates implemented by foreign central banks and (2) insensitivity by member banks toward changes in the federal funds rate. Through July of this year, preferred stock buyers totally ignored the Fed’s federal funds rate increases. But that started to change during early-August, as preferred stock prices realized their second most significant drop so far this year. And prices have remained relatively flat since then as investors appear to be anticipating another federal funds rate hike this coming December. When combined with the surge of new issues that we have seen over the last five months, there may be reason to be optimistic that upward pressure on rates has finally built up enough to start pushing prices down in a meaningful way. But many things affect the market prices of these securities such as the proximity to their call or maturity date, proximity to their next ex-dividend date, industry and/or overall health of the issuer, perceived direction of interest rates, pending government regulatory or policy changes, cumulative versus non-cumulative dividends and tax treatment of dividend payments. So what we really need to look at is current yield, which calculates the average annual dividend yield per dollar invested (without considering re-invested dividend return or any future capital gain or loss). Current yield is a “bang-for-your-buck” measure of value that normalizes differences in coupon rate and price to give us a single, comparable metric. While the continuing strong demand for U.S. preferred stocks can be attributed to several factors, the next chart makes it pretty clear that the lack of attractive alternatives is certainly among them. 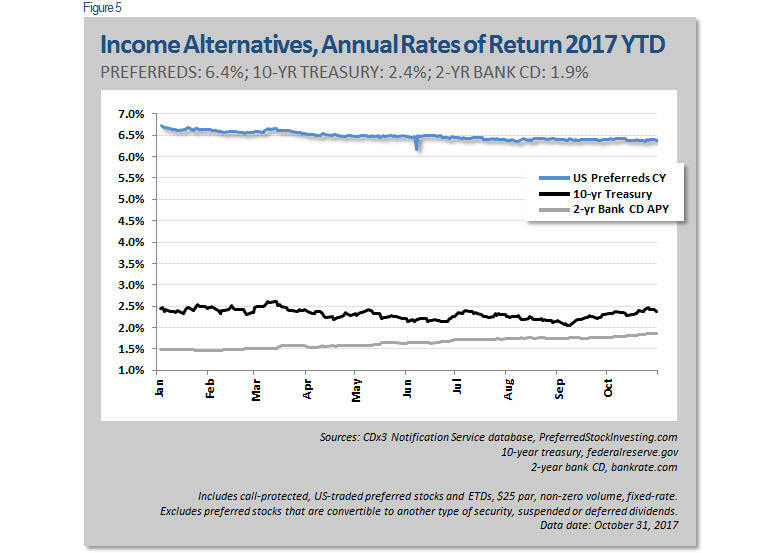 U.S.-traded preferred stocks are currently returning an average current yield of 6.4 percent (blue line) while the annual return being offered to income investors by the 10-year treasury is 2.4 percent and that of the 2-year bank CD is a meager 1.9 percent. For comparison, I have set the Yield column in the first table above to show the current yield of the new October preferreds on October 31. It is into this marketplace that October’s new issues were introduced. With an average current yield of 6.4 percent, plus the 6.3 percent annualized value gain, those investing in U.S.-traded preferred stocks since the beginning of 2017 are currently on pace for a total annualized return of 12.7 percent (6.4 percent of which is realized in dividend cash). Starting at 2252 at the beginning of the year (January 3, 2017 open), the S&P500 common stock value index closed on October 31 at 2575, an unrealized annualized value gain of about 17.2 percent plus about two percent in average annualized dividend yield – a year-to-date annualized gain of about 19.2 percent for common stock investors. Preferred Stock Investing is one of the highest reader-rated books in the United States with 98 reviews posted at Amazon. (c) 2017 Del Mar Research, LLC. All rights reserved.